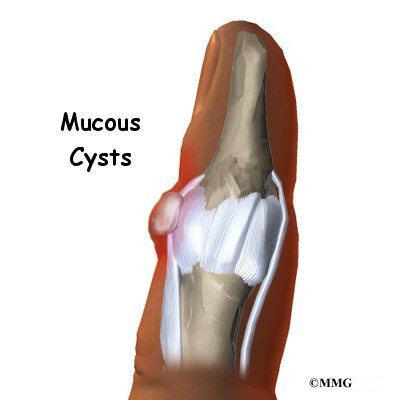 Mucous cysts are small, fluid-filled sacs that form on the fingers. They are associated with osteoarthritis (OA) and usually develop in patients 50 to 70 years old. These cysts appear between the last joint of the finger and the bottom of the fingernail. Unless a mucous cyst is painful or in danger of rupturing, it can be left alone without causing harm to the patient. But even surgically removing a mucous cyst may not alleviate pain if the underlying cause of the pain is OA. What part of the finger is involved? The bones of the fingers are called the phalanges. Each finger has three phalanges, separated by two interphalangeal joints (IP joints). The one closest to the knuckle is called the proximal IP joint (PIP joint). The joint near the end of the finger is called the distal IP joint (DIP joint). Ligaments are tough bands of tissue that connect bones. Several ligaments hold each finger joint together. These ligaments join to form the joint capsule of the finger joint. The joint capsule is a watertight sac around the joint. The joint surfaces are covered with a material called articular cartilage. This material is slick and spongy, and it allows one side of a joint to slide against the other joint surface easily. When this material wears out, the joint develops osteoarthritis (OA). A mucous cyst is a type of ganglion, a small, harmless sac filled with a clear, sticky fluid. The fluid is a mix of chemicals normally found in the body. A mucous cyst is a ganglion of the DIP joint. The cyst is attached to the joint by a stalk of tissue. Typically only one cyst appears, though an occult (concealed) cyst may also be found closer to the joint. Mucous cysts are typically found in patients with OA. Doctors do not know why mucous cysts develop. Doctors also don't understand exactly how these cysts form. One theory suggests that mucous cysts are formed when connective tissue degenerates (wears away). Collagen is a protein found in connective tissue. The leftover collagen is thought to collect in pools, and the pools form cysts. Fluid seems to move from the joint into the cyst, but not the other way. What does a mucous cyst feel like? Your doctor will ask for a history of the problem and examine your fingers. Your doctor may also order an X-ray. An X-ray of the DIP joint may show degeneration related to OA, including bone spurs, joint space narrowing, and hardening of the subchondral bone, the layer of bone just below the articular cartilage in the joint. A patient may also have Heberden's nodes. These are simply the bumps formed by bones spurs arising from the finger joint due to the OA. Another option involves excision (removal) of the cyst and its connection to the DIP joint. Patients should be aware that removing a mucous cyst may not eliminate pain if the pain is from the underlying OA. In this procedure, the cyst, stalk, and any bone spurs on the DIP joint are removed. If the skin on the finger is too closely attached to the cyst, a bit of the skin may need to be removed from the finger. If that's the case, a small skin graft is added to the spot. Surgery can usually be performed using regional anesthesia, meaning only the arm or finger is numbed with lidocaine. Your doctor may simply have you observe for any changes in the cyst. During this period of observation, let your doctor know of any significant increases or decreases in the size of the cyst. If you have surgery to remove a mucous cyst and a skin graft is used, you will wear a cast or splint for two weeks. Otherwise, the fingers can be moved sooner. You will be shown specific exercises to help you regain full motion in the finger. Exercises should be continued until you can move the finger normally without pain.